800 - Emperor Charlemagne, Frankish ruler of France and Germany, crowned Roman emperor by Pope Leo III. 843 - Break-up of Frankish empire; Germany emerges as separate realm. 962 - German King Otto I crowned Roman emperor after gaining control of northern Italy; beginning of what became known as Holy Roman Empire centred on Germany. 1250 - Death of Emperor Frederick II Hohenstaufen marks virtual end of central authority and acceleration of empire's collapse into independent princely territories. 1438 - Election of Albert I marks beginning of Habsburg dynasty based in Austria. 1517 - Martin Luther proclaims Ninety-Five Theses against traditional church practices; start of Protestant split from Catholic Church. 1618-1648 Thirty-Years' War: failure of Habsburg emperors' attempt to restore Catholic dominance and imperial authority against opposition of Protestant princes; 1648 Treaty of Westphalia confirms near total independence of territorial states. 1806 - Napoleon's armies impose French rule over much of Germany; Francis II declares abolition of Holy Roman Empire and adopts title of emperor of Austria. 1813 - Defeat of Napoleon at Battle of Leipzig. 1848 - Year of Revolutions; failure of liberals' attempt to unite Germany under democratic constitution; start of period of rapid industrialisation. 1871 - Otto von Bismarck achieves unification of Germany under leadership of Prussia; new German Empire's authoritarian constitution creates elected national parliament (Reichstag) but gives Kaiser (emperor) extensive powers. 1888 - Start of William II's reign; start of trend towards colonial expansion and build-up of German navy to compete with Britain's; rapid growth of Germany's economic power. 1890 - Growing workers' movement culminates in founding of Social Democratic Party of Germany (SPD). 1918 - Germany defeated, signs armistice. Emperor William II abdicates and goes into exile. 1919 - Treaty of Versailles: Germany loses colonies and land to neighbours, pays large-scale reparations. Beginning of the Weimar Republic, based on a new constitution. Its early years are marked by high unemployment and rampant inflation. 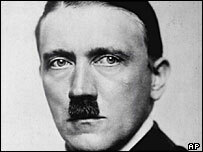 1923 - Adolf Hitler, head of the National Socialist German Workers' (Nazi) Party, leads an abortive coup in a Munich beer hall. France, Belgium occupy the Ruhr over failed reparation payments. Hyperinflation leads to economic collapse. 1924 - Hitler writes Mein Kampf - "My Struggle" - in prison. 1929 - Global depression, mass unemployment. 1933 - Hitler becomes chancellor. Weimar Republic gives way to a one-party state. Systematic persecution of Germany's Jews escalates. Hitler proclaims the Third Reich in 1934. 1935 - Germany begins to re-arm. Nuremberg Laws deprive German Jews of citizenship. 1938 - Annexation of Austria and Sudetenland. Kristallnacht (Night of Broken Glass) sees orchestrated attacks on Jews and their property as well as synagogues. 1939-1945 - Invasion of Poland triggers World War II. Millions of people of all ages, mostly Jews but also large numbers of Gypsies, Slavs and other races, the disabled and homosexuals, die in the Holocaust as the Nazis implement an extermination policy in the death camps of eastern Europe. 1945 - German army defeated. Allies divide Germany into occupation zones. 1945-1946 - Nuremberg war crimes trials. 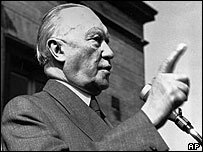 Konrad Adenauer, of the Christian Democrats (CDU) is West Germany's first chancellor. East Germany is led by Walter Ulbricht. 1950s - Start of rapid economic growth in West Germany. 1955 - West Germany joins Nato; East Germany joins the Warsaw Pact. 1957 - West Germany joins the European Economic Community. 1961 - Construction of the Berlin Wall. 1968 - East German constitution declares unification impossible until the West becames socialist. 1969 - Social Democrat (SPD) Willy Brandt becomes chancellor and seeks better ties with the Soviet Union and East Germany. 1971 - Walter Ulbricht is succeeded in East by Erich Honecker. 1973 - East and West Germany join the UN. 1974 - Brandt resigns after spy revelations surrounding one of his aides. New Chancellor Helmut Schmidt continues Brandt's "Ostpolitik" (eastern policies). 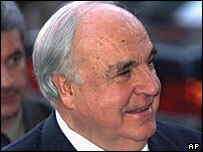 1982 - Christian Democrat Helmut Kohl becomes chancellor. 1987 - East German leader Erich Honecker pays a first official visit to West. 1989 - Mass exodus of East Germans as Soviet bloc countries relax travel restrictions. 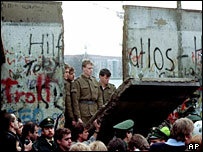 Berlin Wall is torn down. 1990 - Kohl leads a reunified Germany. 1991 - Parliament names Berlin the new capital. 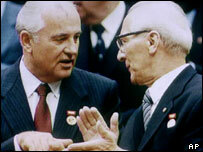 1992 - Erich Honecker is brought back to Berlin from Moscow to face political charges. 1993 - Germany joins the Maastricht Treaty on European union. 1994 - Honecker dies. Kohl re-elected. Constitutional court rules that German troops can participate in UN peacekeeping operations outside Nato. Russian and Allied troops finally leave Berlin. 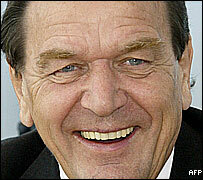 1998 - General election victory for SPD leader Gerhard Schroeder leads to "Red-Green coalition" with the Green Party. Kohl replaced as CDU leader by Wolfgang Schaeuble. Government and industry announce compensation fund for former slave workers under Nazis. 2000 January/April - CDU party funding scandal. Kohl resigns as honorary party chairman after he admits illegally accepting thousands of dollars in party contributions. Party leader Schaeuble resigns over his handling of the scandal. Angela Merkel takes over. 2001 March - European Court of Human Rights rules that three former East German Communist leaders should serve jail terms for sanctioning a policy of shooting would-be escapees at the Berlin Wall. The Court said that the men - among them the last East German leader Egon Krenz - had violated international human rights law. 2001 June - Government and nuclear industry representatives sign agreement to phase out nuclear energy entirely over next 20 years. 2001 November - Chancellor Schroeder survives parliamentary confidence vote over the government's decision to deploy 4,000 troops in the US-led campaign in Afghanistan, Germany's largest deployment outside Europe since World War II. 2002 January - Euro replaces Deutsche Mark (DM). 2002 March - Government pushes controversial immigration bill through upper house of parliament. It allows a limited number of skilled non-EU workers into the country. Former Chancellor Helmut Kohl wins court battle to prevent access to files held on him by the former East German secret police, the Stasi. The ruling also puts out of bounds files on many other people. 2002 August - City of Dresden is submerged under floodwater from River Elbe following torrential rain across central Europe. Schroeder says situation is national catastrophe, announces plan to finance repairs by delaying proposed tax cuts. 2002 September - Schroeder re-elected but with a sharply reduced majority thanks to good showing by his coalition partners, the Greens. 2003 March - Constitutional Court decides not to uphold government request to ban neo-Nazi National Democratic Party because of accusations that government informants planted in party ranks had acted as agents provocateurs to discredit it. 2004 May - Opposition CDU-backed candidate Horst Koehler, former IMF head, elected president. 2004 August/September - Tens of thousands protest in streets, particularly in eastern regions, over government plans to cut unemployment benefit and other welfare and labour reforms. 2005 March - Edited East German secret police files on former chancellor Helmut Kohl made available to researchers under certain conditions. Mr Kohl had fought a long legal battle to prevent publication. 2005 May - After his party suffers defeat in North Rhein-Westphalia regional election, Chancellor Schroeder announces that he will seek early general elections. 2005 July - President calls early general elections after Chancellor Schroeder deliberately loses a confidence vote in parliament in order to trigger the poll. 2005 September - Elections produce very close result. Coalition talks follow. 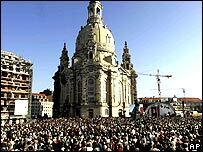 2005 October - Dresden's Frauenkirche reconsecrated 60 years after its destruction by Allied bombers. 2005 November - Angela Merkel of the CDU becomes chancellor in a "grand coalition" involving the CDU and SPD. 2006 July - Parliament approves far-reaching changes to the way in which Germany is governed; the reforms are intended to speed up decision-making. 2006 August - Police say two bombs, discovered on regional trains near Cologne at the end of July, were intended to kill large numbers of people. The devices failed to go off. 2006 November - Unemployment falls below 4 million for the first time in four years. 2008 March - Chancellor Angela Merkel makes historic address to Israeli parliament (Knesset) during a trip marking the 60th anniversary of the founding of Israel. Her address is the first ever given to the Knesset by a German head of government. 2008 October - Germany agrees a $68bn plan to save one of the country's largest banks, Hypo Real Estate, from collapse. European governments pledge up to 1.8 trillion euros as part of co-ordinated plans to shore up their financial sectors, hit hard by the global financial crisis. Germany says it will make as much as 500bn euros available in loan guarantees and capital to bolster the banking system. 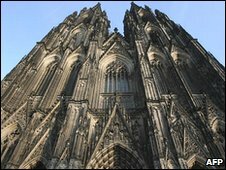 2008 November - Germany is declared to be officially in recession. 2009 February - Parliament approves $63bn stimulus package aimed at shoring up recession-hit economy. 2009 August - Figures are released showing that economy grew by 0.3% in last quarter, bringing country out of recession. 2009 September - Angela Merkel wins another four years in office as her centre-right alliance (CDU/CSU) secures victory in general election. 2009 October - Mrs Merkel's CDU seals coalition deal with pro-business Free Democrats (FDP) after parties reach agreement on major tax cut proposals. 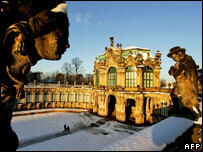 2010 - Official data shows the German economy shrank by 5% in 2009, hit by a slump in exports and investment. 2010 March - Four Islamists are convicted by a court in Germany of plotting to attack US facilities in the country. 2010 May - Germany's parliament votes to approve a 22.4bn euro German contribution to bail out debt-ridden Greece, prompting widespread public anger. Chancellor Angela Merkel's governing centre-right coalition suffers a defeat in regional elections in North-Rhine Westphalia, losing its majority in the upper house of parliament. 2010 September - Cabinet approves controversial plan to extend lifespan of Germany's nuclear reactors, reversing 2001 decision to phase out nuclear energy by 2021. 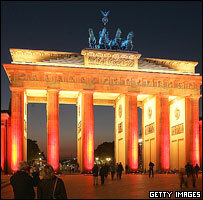 2011 January - Provisional figures show the economy grew by 3.6% in 2010, its fastest pace since reunification in 1990. Economists attributed the rate to a recovery in exports. 2011 March - Setback for Chancellor Angela Merkel as her Christian Democrats lose the key state of Baden-Wuerttemberg for the first time in six decades. 2011 May - In further u-turn on nuclear power following crisis at Japan's Fukushima plant, German government says all nuclear power plants will be phased out by 2022. 2011 July - Chancellor Merkel defends her decision to back second huge bail-out for Greece, insisting that it is Germany's historic duty to protect the euro. 2011 August - Provisional figures show that German economic growth slowed almost to a standstill in the second quarter of 2011. 2012 March - Joachim Gauck elected president, succeeding Christian Wulff, who resigned in February over a financial scandal.